On Sunday a very rare event occurred: I found myself at home alone for over an hour. I decided that this was such a blue moon alignment of schedules that I was entirely justified in spending the whole time on myself. Of course, inevitably I pottered around and frittered away time for a bit but I did settle down at my art table, open up my art journal, and set to work. For the first time in a very long time, I completed an art journal page, from beginning to end, in one setting. I used the drying time of the first layer for a cup of tea. I decided to work on last week’s Art Journal Adventure prompt which was the letter G. As I have mentioned before, I like vague prompts because they are so open-ended but I appreciate having a prompt as a nudge to just get on with something, anything. I was in a spooky, monster making sort of mood so I decided that G would be for Ghost. 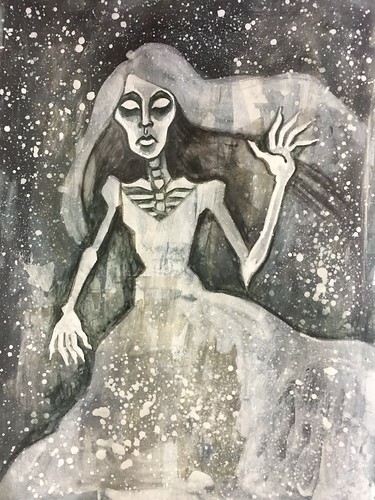 I wanted my ghost to be appearing out of the gloom so I started by making the page dark and gradually pulled in lighter layers while narrowing the focus until I was using white for the highlights on the ghostly figure. The proportions, especially of the arms, are terrible but who cares really. 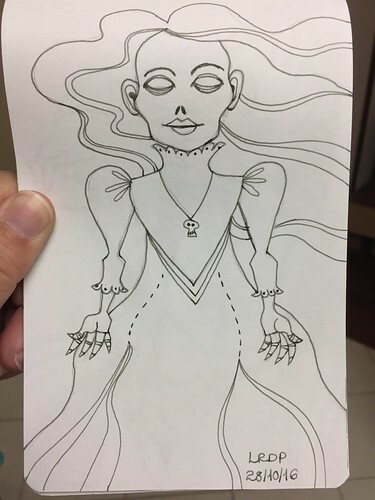 It’s only an art journal page and, besides which, she’s a ghost. Perfection isn’t an option when you are the wailing, moaning, unsettled undead. Ultimately the outcome on the page is irrelevant. What really matters is that, after a long period of meagre rations of art time, I got to spend a whole feast of time playing around with art materials and getting messy. 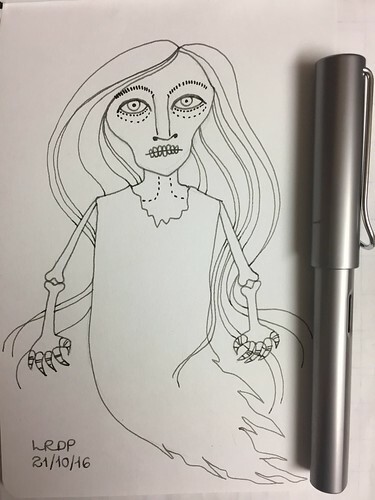 So far my Inktober sketchbook includes a Phantom and a Ghost but I decided I needed to up the creep factor with my drawings of spectres. I wanted to try and illustrate the kind of ghostly figure you really would not want haunting the dark corners of your home. Is it just me or did she end up looking like some weird fusion of Bette Davis and Joan Crawford? 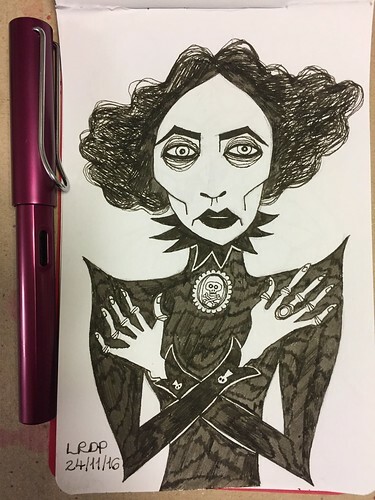 Today for Inktober I again followed the Drawlloween prompt which was “Ghosts A Go Go”. I had already drawn a ghost a week ago in response to the prompt “Phantom” but I thought I could maybe draw a different sort of ghost this time. Today is one of my manically busy days so it was handy to be able to draw something that was simple line work with my fountain pen. That made producing a daily drawing manageable, feasible. While yesterday’s Inktober drawing took me a good while, I had to keep today’s drawing short and simple. The Drawlloween prompt was “Phantom Phriday” and at first I thought of drawing the Phantom of the Opera. However, I painted the Lon Chaney version in my altered book last year and wanted to avoid simply replicating that but I could not think of an alternative version who would be freaky enough for my sketchbook. So then I thought of a phantom as being a ghost and that seemed much easier and simpler to draw in a hurry this morning. No filling in, just line work. Job done and so far I am keeping up with this challenge to draw daily. Having kids is often like running a long term psychological experiment. Whenever I have the opportunity to take a step back from the coal face of parenting, I find it fascinating to study these wee creatures I share living space and DNA with. My kids have amazing imaginations and have the ability to conjure up games to play out of nothing more than sticks and pebbles and sometimes just out of nothing. Of course, they also have the ability to claim, with annoying regularity, that they have “nothing to play with” despite having a basement playroom stocked substantially with toys. As I said: psychology. Sometimes those imaginative games cause a bit of havoc. For example, some years ago, in a village churchyard in England, my boys decided to entertain themselves while I wandered around the graves. Inspired by a war memorial, they decided to reenact trench warfare using daisies versus buttercups in the long grass. It was all fun and games until one of them bellowed, “Die, Germans, die!” – at the exact moment that a bus full of German tourist disembarked into the church yard. On a more domestic level, one of my children once delayed leaving the house because he was packing his invisible backpack full of invisible items he might need for the trip. I became increasingly frustrated as I watched him scuttle up and down stairs several times having forgotten his invisible sword and invisible helmet. “Can’t you just imagine that you didn’t forget?” I pleaded. In vain. Then there was the time they had a ferocious argument over the unfair distribution of invisible sweeties. It was, therefore, bound to go a bit crazy when the younger three decided to make up a resident poltergeist for our house. Alas, it may have been me who inspired them. I am one of those mothers who ask (or yell) rhetorical questions in a futile attempt at making my kids realise they have done something annoying. Then there are the interrogations where nobody confesses and I have inadequate evidence to press charges. I like to snark, at no one in particular, “Well if none of you did it then I guess the ghost is to blame!” Obviously, therefore, they needed a ghost to blame. That is how Joey appeared. At first it was quite amusing. The boys created this whole tragicomic backstory for Joey to explain why he was haunting our house. Any mischief was, of course, down to Joey but the kids accepted that wraiths cannot be directed by furious mothers to put things right so they would have to help Joey out. Joey trashed the bedroom. Oh well, you kids will just have to tidy it all back up again. Joey doesn’t want us to eat this dinner because it looks gross. Oh well, Joey will just have to watch you go hungry then. Then the night time nonsense started. They couldn’t get to sleep at night because Joey was keeping them awake. They were too scared of Joey haunting them to be able to sleep with the light off or without sharing a bed. That got old really quickly. There are child-generated nonsenses I can cope with and manage during the day that I just cannot tolerate when I am frazzled at the end of the day and especially if I am both frazzled and sleep deprived. “But I am scared.” Throw in some puppy dog eyes and a lip quiver for maximum effect. Finally their imaginations moved on to new things and Joey was forgotten. It was as if an Exorcist had been around. Thank goodness. No more nocturnal whimperings about being haunted by a ghostly boy. No more being haunted at night time by our own kids. Then, just last week, Joey was back. A sequel to the ghost story. Snuggled up on the sofa with the kids watching a movie one evening, my 9 year old looked stricken towards the window, raised a finger to point, and said, “Joey’s face is at the window”. And it all started again. Sigh. Joey, who had been forgotten, was firing up their imaginations again. Powerful imaginations are great. I just wish I could switch them off and power them down every evening.